The One Piece towel measures 29.5 x 59 inches long. 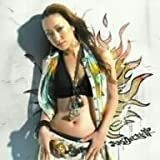 lecca (pronounced as “Rekka”, name is lowercased) is a well-known reggae MC on the Cutting Edge record label. Her music is a combination of reggae dance hall and pop R&B.